Has Mexico’s telecommunications reform of 2013 been a success? In September 2013, as part of the Pacto por México initiated by the then newly elected President Enrique Peña Nieto, the Federal Commission of Telecommunications (Comisión Federal de Telecomunicaciones, or CoFeTel) was replaced by the Federal Telecommunications Institute (Instituto Federal de Telecomunicaciones or IFT). This new, autonomous federal agency, which is headed by a board of seven commissioners, set out to undo the longstanding monopoly of América Móvil and its Telmex (fixed line) and Telcel (mobile) business units. At the time, América Móvil controlled 71% of the landline business and 82% of the mobile market. Its owner, Carlos Slim Helú, was ranked as the richest person in the world, but in terms of operational metrics Mexico's telecom market was nowhere near that of a developed country. A key objective of the telecom reform was to split América Móvil's fixed line and mobile business units. It has been three and a half years since the reforms began (or at least three years since they were officially ratified by Mexico's legislature) and the break up of América Móvil has yet to be finalised. Despite losing market share, revenue at the company have grown and the company is now more of a leader for all Latin America. Rather than suffering a financial setback, the Carlos Slim family seems to have prospered since the reforms. So, what has changed? • The price of telecommunication services in Mexico dropped by 29% between June 2013 and December 2016, even though the rate of inflation over that period was 12.8%. • The concept of national long-distance phone calls became obsolete. • The cost of international long-distance phone calls dropped by 40%. • The average mobile phone bill dropped by 43%. • The ability to easily switch mobile operators with number portability became widely implemented. • Since June 2013, the number of paid TV subscriptions (cable or satellite) has risen by 33%; currently, 60% of Mexican homes have a paid TV subscription. • Fixed residential broadband access grew 19% between Q4 2013 and December 2016. currently, 48% of Mexican homes have broadband Internet service. As recently as 2011, when efforts to pass the telecom reform were gathering strength, only 11% of the population had broadband access in their homes, with multiple family members in each home, it is now estimated that 61% of the population has broadband access. • More than 80% of Mexican homes with broadband service currently enjoy download speeds of 10 Mbit/s or better; in 2015, most home were receiving download service in the 2~9 Mbit/s range. • Broadband via coaxial cable is quickly gaining in popularity and now accounts for 35% of the market; DSL service continues to account for the largest share of the market but is dropping in popularity, while FTTH is rising at a 150% annual growth rate. • In 2013, América Móvil (Telmex) controlled 71% of the fixed broadband access market, followed by Grupo Televisa at 12%, Megacable-MCM at 6%, and a number of other providers; by 2016, Telmex had lost 14.5 market share percentage points to its rivals and now controls under 57% of the fixed broadband access market. • In mobile broadband, América Móvil (Telcel) has also seen its share drop from 82% in 2013 to 72% in 2016; leaders in Mexico mobile broadband include: América Móvil (Telcel) at 72%, Telefonica at 14%, AT&T at 12%, and a handful of other players capturing the rest. 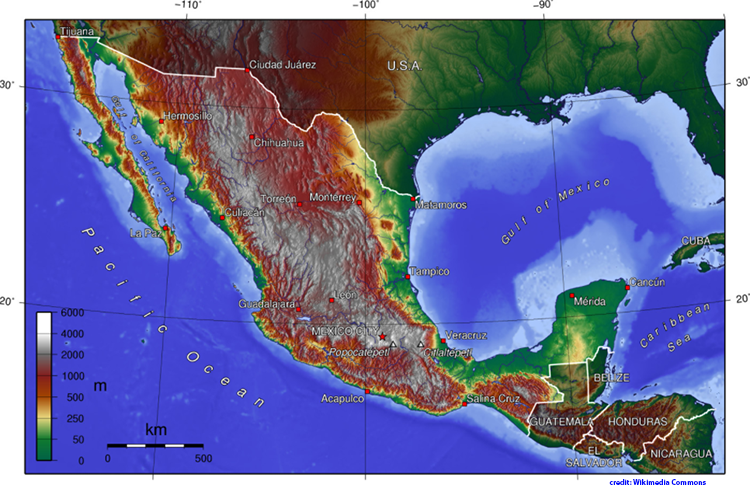 • The amount of licensed spectrum has risen, before 2013, a total of 222 MHz was available for licensing; currently, 404 MHz is available for commercial use with the addition of 190 MHz of 2.5 GHz bands, Mexico will soon have 594 MHz of spectrum for commercial services. • Mexico became the first country in Latin America to end analogue TV service. • Private investment in telecommunications in Mexico rose 76% between 2014 and 2016, including many direct foreign investments. IFT also noted that telecommunication service providers have also benefited directly from the reforms, as the total revenue collected by these companies rose from MXP 399 million in 2013 to MXP 456 million in 2016. Mobile revenue now accounts for 55% of the market, while fixed line accounts for 45%. There has been limited public information about the Red Compartida (shared network) project since the selection of ALTÁN Redes as the principal contractor late last year. Red Compartida is sometimes described as the largest construction of a new public access network in the world, although it is eclipsed by the FirstNet emergency response project in the U.S.
• Red Compartida will only offer wholesale mobile services. • Red Compartida will build a new national network covering at least 92.2% of the population. • The commercial launch date will be March 31st, 2018, an aggressive target! • Red Compartida's largest investor at 33% is Marapendi Holding BV, an indirect subsidiary of North Haven Infrastructure Partners II, an infrastructure fund with a value-add strategy to invest in OECD countries around the world, managed by Morgan Stanley Infrastructure; Caisse de dépôt et placement du Québec(CDPQ), one of North America's largest pension fund manager holds a 12.68% share; Mr. Miguel S. Escobedo holds a 9.35% share; and Mr. Eugenio Galdón, Chairman of Multitel, holds a 3.34% share. • Axtel and Megacable also hold a stake in ALTÁN Redes through a series of non-voting shares and without involvement in management; each have a participation of 4.01%. • In March, ALTÁN Redes selected Huawei and Nokia as turn-key technology providers for Red Compartida, a pure IP + LTE network. • Huawei technology will be used for central and southern Mexico (telecommunications regions 6 to 9), as well as providing the backbone. • Nokia's technology will be rolled out in the northern part of the country (regions 1 to 5). Nokia will also supply the network Core, which includes the Network Operation Center (NOC) and Security Operation Center (SOC). Finally, it should be noted that AT&T continues to invest heavily in Mexico, even though it may or may not be allowed to participate in the wholesale Red Compartida mobile infrastructure program when it comes online. AT&T's LTE network now covers 88 million people in Mexico and it expects to reach 100 million PoPs by the end of 2018. For Q2 2017, AT&T reported that wireless revenues from Mexico were $665 million, up 9.7% versus the year-earlier quarter, largely due to subscriber growth, which was partially offset by competitive pressures and foreign exchange. AT&T added 92,000 post-paid subscribers and 402,000 prepaid subscribers in Q2. It now has 13.1 million total wireless subscribers in Mexico, a 31% increase from a year ago. FCC Chairman Ajit Pai circulated a Notice of Proposed Rulemaking with his fellow commissioners at the FCC aimed at reversing the Title II "Net Neutrality" rules adopted in 2015. In a published speech, Pai described the Title II rules as a regulatory mistake that slowed down telecom infrastructure spending in the United States by 5.6% percent, or $3.6 billion, between 2014 and 2016 for just the top 12 Internet service providers. He said the rules were not needed in 2015 because the Internet "was not broken" and that these 1930s era regulations were constraining the further rollouts of new infrastructure. Key elements of Pai's proposal include (1) return the classification of broadband service from a Title II telecommunications service to a Title I information service (2) eliminate the so-called Internet conduct standard (3) seeks comment on how the FCC approach the so-called bright-line rules adopted in 2015. 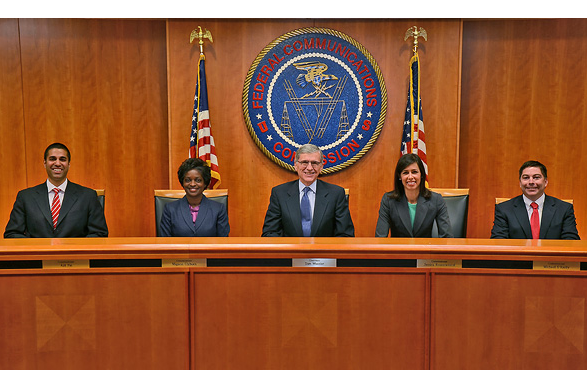 The FCC will vote on the Notice of Proposed Rulemaking at its meeting in May. A Standard for Future Conduct: the Order establishes that ISPs cannot “unreasonably interfere with or unreasonably disadvantage” the ability of consumers to select, access, and use the lawful content, applications, services, or devices of their choosing; or of edge providers to make lawful content, applications, services, or devices available to consumers. The FCC will have authority to address questionable practices on a case-by-case basis, and will provide guidance in the form of factors on how the Commission will apply the standard in practice. consistent format, promotional rates, fees and surcharges and data caps. Disclosures must also include packet loss as a measure of network performance, and provide notice of network management practices that can affect service. To further consider the concerns of small ISPs, the Order adopts a temporary exemption from the transparency enhancements for fixed and mobile providers with 100,000 or fewer subscribers, and delegates authority to the FCC's Consumer and Governmental Affairs Bureau to determine whether to retain the exception and, if so, at what level. Reasonable Network Management: For the purposes of the rules, other than paid prioritization, an ISP may engage in reasonable network management. The FCC's standard takes account of the particular engineering attributes of the technology involved—whether it be fiber, DSL, cable, unlicensed Wi-Fi, mobile, or another network medium. However, the network practice must be primarily used for and tailored to achieving a legitimate network management—and not business—purpose. Interconnection: the FCC address issue that may arise in the exchange of traffic between mass-market broadband providers and other networks and services. Under the authority provided by the Order, the Commission can hear complaints and take appropriate enforcement action if it determines the interconnection activities of ISPs are not just and reasonable. 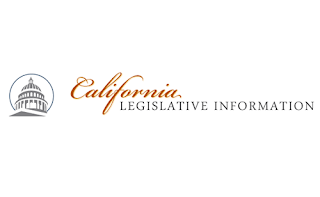 Legal Authority: the order relies on multiple sources of authority including both Title II of the Communications Act and Section 706 of the Telecommunications Act of 1996. At the same time, the Order refrains – or forbears – from enforcing 27 provisions of Title II and over 700 associated regulations that are not relevant to modern broadband service. BT and UK regulator Ofcom announced that they have reached agreement on a long-term regulatory settlement based on voluntary commitments submitted by BT that address Ofcom's competition concerns through which Openreach will become a distinct, legally separate company with its own board within the BT Group. 1. Approximately 32,000 employees will transfer to the new Openreach Limited, following TUPE consultation, and once pension arrangements are in place. 2. Openreach will manage and operate its assets and trading, but ownership of the assets and trading will remain with BT. 3. The new Openreach will have its own branding that will not feature the BT logo. 4. The Openreach CEO will report to the Openreach chairman, with accountability to the BT Group chief executive with regards to certain legal and fiduciary duties consistent with BT's responsibilities as a listed company. 5. Openreach, which builds and maintains the millions of copper and fibre access lines from telephone exchanges to homes and businesses and currently delivers fibre connections to around 26 million premises, will gain greater independence under its own board of directors. The agreement, once implemented, is designed to provide BT and other companies with greater regulatory clarity and certainty and to encourage investment. The new agreement builds on recent changes made by BT relating to the governance of Openreach, which include the creation of an Openreach board with a majority of independent members. The new Openreach board will define the businesses medium term and annual operating plans and determine which technologies are deployed within line a strategic and financial framework defined by BT. Openreach will be free to explore alternative co-investment models with third parties. BT stated that implementation of the agreement is subject to the satisfaction of certain conditions, including the drawing up of new legislation relating to the BT pension scheme. In addition, formal approval of the agreement is required by the BT board. The FCC's Wireless Telecommunications Bureau has ended its investigation into wireless carriers' free data offerings. Openreach, the wholly owned and independently governed division of the BT Group, appointed Sir Brendan Barber and Edward Astle as independent members of a newly formed Board to oversee strategy, investment and service delivery at the UK’s leading digital infrastructure company. The company said that establishing the new Board is central to governance reforms that Openreach has been implementing to become a more transparent and autonomous business. Sir Brendan Barber is former General Secretary of the Trades Union Congress and current chair of Acas. Edward Astle is a former Board member of National Grid. 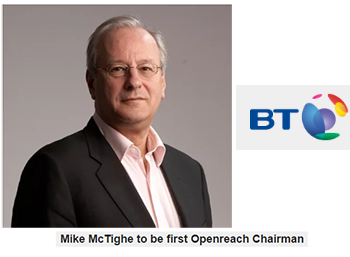 Mike McTighe was appointed independent Chairman of Openreach in December 2016. A fourth independent non-executive is due to be announced imminently with a specific focus on customer service. The FCC, now under the Chairmanship of Ajit Pai, announced the elimination of two public inspection file requirements: (i) the requirement that commercial broadcast stations retain in their public inspection file copies of letters and emails from the public; and (ii) the requirement that cable operators maintain for public inspection the designation and location of the cable system’s principal headend. The FCC said the eliminating the correspondence file and principal headend public file requirements will reduce regulatory burdens on commercial broadcasters and cable operators. President Donald J. Trump designated Ajit Pai as his choice to be Chair of the FCC. 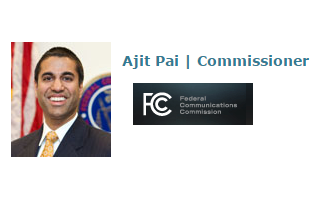 Ajit Varadaraj Pai was nominated for FCC Commissioner by President Obama in 2011. Pai took over the seat abandoned by Meredith Baker who left the FCC to take a job as a lobbyist for Comcast. Pai was previously a Partner in the Litigation Department of Jenner & Block LLP. Previously, Pai worked in the Office of the General Counsel at the Federal Communications Commission, where he served as Deputy General Counsel, Associate General Counsel, and Special Advisor to the General Counsel. He holds a B.A. from Harvard University and a J.D. from the University of Chicago. American public to bring the benefits of the digital age to all Americans," stated Ajit Pai. 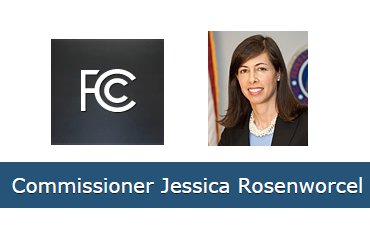 President Obama reappointed Jessica Rosenworcel to serve a second term on as commissioner at the FCC. Jessica Rosenworcel replaced long-term FCC Commissioner Michael Copps when his term ended in December 2011. She previously was the Senior Communications Counsel for the United States Senate Committee on Commerce, Science, and Transportation. Before that, she worked for Senator Jay Rockefeller IV, and at the FCC from 1999 to 2007, serving as Legal Advisor and then Senior Legal Advisor to Commissioner Michael J. Copps (2003-2007), Legal Counsel to the Bureau Chief of the Wireline Competition Bureau (2002-2003), and as an Attorney-Advisor in the Policy Division of the Common Carrier Bureau (1999-2002). She holds a B.A. from Wesleyan University and a J.D. from New York University School of Law. Ofcom, the official regulator for the telecom market in the UK, will seek the legal separation of Openreach from BT. Openreach is the division of BT Group that develops and maintains the UK’s main telecoms network used by providers such as Sky, TalkTalk, Vodafone and BT’s retail business. 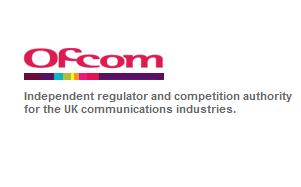 Ofcom said the decision follows after BT failed to offer voluntary proposals that address competition concerns. Ofcom believes BT has the incentive and ability to favour its own retail business when making strategic decisions about new network investments by Openreach. This concern arises because BT runs the national network, Openreach, as well as its own retail business. The Ofcom proposal requires Openreach to become a distinct company with its own Board, consisting of a majority of directors who would not with BT. Ofcom is now preparing to notify the European Commission of its intention to implement these plans, requiring the legal separation of Openreach to make it more independent. The FCC adopted rules to identify and open up millimeter wave spectrum to support the rapid advancement to 5G networks and technologies in the United States. Specifically, the new rules open up almost 11 GHz of spectrum for flexible use wireless broadband – 3.85 GHz of licensed spectrum and 7 GHz of unlicensed spectrum. The FCC said it is committed to moving fast to establish U.S. leadership in 5G, noting that the nation is the first to open millimeter wave spectrum for 5G. bands, and an unlicensed band at 64-71 GHz. A "5G Manifesto" from key players in the telecom industry was submitted to EC Commissioner Oettinger with the aim of spurring deployment of 5G infrastructure in Europe. The 7-page manifesto provides recommendations for a common vision and a calendar for deployment of investments, standards and the synchronized introduction of services in Europe. It underlines the need for spectrum and improved regulatory conditions in terms of local installation of cells, open internet rules which promote innovation, data protection and fair use. The European Commission is working on a 5G Action plan that will be presented in September that aims at giving Europe the leadership in the deployment of standardized 5G networks as from 2020. Signatories of the manifesto include the chief executives of BT Group plc., Deutsche Telekom, Ericsson, Hutchison Whampoa Europe, Inmarsat, Nokia, Orange, Proximus, Royal KPN, SES, Tele2 AB, Telecom Italia, Telefonica, Telekom Austria, Telenor, Telia, and Vodafone Group. 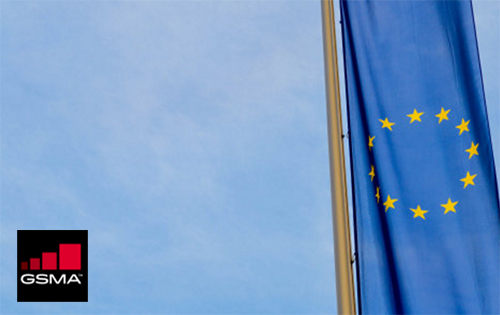 The GSMA published a list of seven policy recommendations for Europe to regain a leading position in mobile. 1. Change objectives of the EU telecoms framework to target investment and sustainable competition in the long term interests of consumers European regulation must aim to achieve consistently higher levels of network investment than it has seen in recent years if it is to achieve Europe’s ambitions in 5G. This is only possible if regulators target sustainable levels of competition to maximise consumer benefits over the long term. The framework should therefore require regulators to promote growth, innovation, and investment in communications markets for the long-term benefit of end users. With new forms of competition in telecoms services markets on the rise, policymakers must seize the opportunity to deregulate and gain a leading role for Europe in 5G. Sector-specific regulation should be withdrawn where competition exists. The “deregulation” initiative should also include the removal of conditions in spectrum licences, such as wholesale access obligations, which are unrelated to the efficient allocation of spectrum. 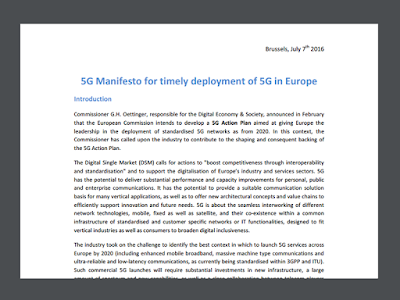 The significant increase in investment levels needed to drive a European roadmap to 5G will only be achieved if the costs of mobile network deployment are significantly reduced. The European Commission should examine what can be done to further reduce the costs of mobile network deployment, including the costs of sites, spectrum fees and other input taxes. BEREC should lead in developing a better understanding of the factors needed to produce high performing markets that meet the needs of consumers. Regulators should seek to expand the supply of spectrum in order to reduce the need for spectrum caps or other interventions. The demands placed on mobile networks today are straightforward in comparison with the future requirements of the “Internet of Things”, connected apps and an expected significant growth in data traffic over the next five years. Regulations that set simple, uniform targets for network coverage or that equate network quality with speed will no longer be appropriate or relevant in the future. Net neutrality regulations that ignore the vastly different performance standards required by different applications will inhibit innovation, raise costs and harm consumers. Spectrum policy needs to be growth and investment-focused if Europe is to take a leading role in 5G. We need to simplify and clarify renewal terms and aim to move to perpetual licences in the long term. As more spectrum is released, the need for spectrum caps should reduce, while action is needed on fees, reserve prices and regulatory obligations to ensure that spectrum is licensed in a way that promotes the network investment required to exploit it. European policymakers should ensure they prioritise mobile when designing policies to address wider goals and the delivery of public services to citizens. Many of these goals will be achieved commercially if the supplementary actions proposed by the GSMA are implemented. If subsidies are required to meet objectives that benefit society as a whole, then they should be met from general taxation. The FCC is proposing new privacy guidelines to ensure broadband customers have meaningful choice, greater transparency and strong security protections for their personal information collected by ISPs. • Consent Inherent in Customer Decision to Purchase ISP’s Services: Customer data necessary to provide broadband services and for marketing the type of broadband service purchased by a customer – and for certain other purposes consistent with customer expectations, such as contacting public safety – would require no additional customer consent beyond the creation of the customer-ISP relationship. • Opt-out: Broadband providers would be allowed to use customer data for the purposes of marketing other communications-related services and to share customer data with their affiliates that provide communications-related services for the purposes of marketing such services unless the customer affirmatively opts out. • Opt-in: All other uses and sharing of consumer data would require express, affirmative “opt-in” consent from customers. to adopt risk management practices; institute personnel training practices; implement strong customer authentication requirements; identify a senior manager responsible for data security; and take responsibility for use and protection of customer information when shared with third parties. • Common-sense data breach notification requirements to encourage ISPs to protect the confidentiality of customer data, and to give consumers and law enforcement notice of failures to protect such information. The ITU's World Radiocommunication Conference 2015 (WRC-15 kicked off in Geneva and is scheduled to run through the end of November. 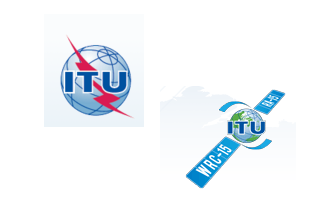 The WRC is held every three to four years to review, and, if necessary, revise the Radio Regulations, the international treaty governing the use of the radio-frequency spectrum and the geostationary-satellite and non-geostationary-satellite orbits. Mobile broadband communications: Provision of additional frequencies to meet the rapidly growing demand for mobile broadband communications. Emergency communications and disaster relief: Allocation of frequencies for advanced public protection and disaster relief. Global flight tracking for civil aviation: WRC-15 will consider allocating spectrum for global flight tracking for improved safety. Enhanced maritime communications systems: Maritime communications, facilitating the use of on-board digital transmissions and automatic identification system on vessels for improved navigation safety. Operation of satellite systems: Allocation of spectrum for broadband satellite systems; providing for earth stations on-board moving platforms, such as ships and aircraft; and improving coordination procedures to make more efficient use of spectrum and satellite orbits. Universal Time: examining the feasibility of achieving a continuous reference time-scale, by modifying Coordinated Universal Time (UTC). The European Commission gave its stamp of approval to the proposed acquisition of Alcatel-Lucent by Nokia, saying the merger does not raise competition concerns "because the parties are not close competitors and since a number of strong global competitors will remain active after the transaction." The Commission said it considered the effects of the merger on competition in the field of mobile network equipment, including Radio Access Network equipment and Core Network Systems. The Commission found that, despite the merged entity having combined market shares around or above 30% for several specific types of equipment, the overlaps between the two companies' activities are effectively limited. 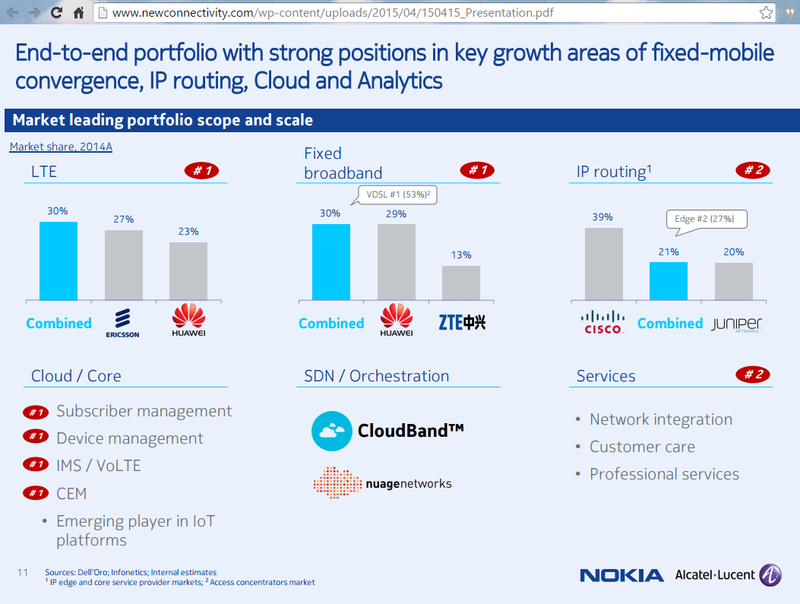 Indeed, Nokia has a strong presence in the European Economic Area, where Alcatel-Lucent is a small player, and conversely Alcatel-Lucent has a strong presence in North America, where Nokia's activities are rather limited. The EC cited competition from Ericsson and Huawei, along with the emerging presence of ZTE and Samsung, especially with regards to upcoming 5G. Nokia agreed to acquire Alcatel-Lucent in a deal valued at EUR 15.6 billion -- a premium to shareholders of 28% (equivalent to EUR 4.27 per share) over the unaffected weighted average share price of Alcatel-Lucent for the previous three months. Under the transaction Nokia will make an offer for all of the equity securities issued by Alcatel-Lucent, through a public exchange offer in France and in the United States, on the basis of 0.55 of a new Nokia share for every Alcatel-Lucent share. The boards of directors of both companies have agreed to the deal. Nokia said it was motivated to do the deal because the addressable market of the combined company in 2014 was approximately 50% larger than its current addressable networks market, increasing from approximately EUR 84 billion to approximately EUR 130 billion. The combined company is expected to have a stronger growth profile than Nokia’s current addressable market, with an estimated CAGR of approximately 3.5% for 2014-2019. The combined company will be called Nokia Corporation, with headquarters in Espoo, Finland and a strong presence in France. It will also have major R&D centers in Germany, the U.S. and China. It will retain its Bell Labs brand in the U.S..
For France, Nokia said intends to maintain employment levels consistent with Alcatel-Lucent’s end-2015 Shift Plan commitments, with a particular focus on the key sites of Villarceaux (Essonne) and Lannion (Côtes d’Armor). Plans also include a 5G R&D centre of excellence in France. Risto Siilasmaa is planned to serve as Chairman, and Rajeev Suri as Chief Executive Officer. The combined company would target approximately EUR 900 million of operating cost synergies to be achieved on a full year basis in 2019. The cost savings will come from organizational downsizing, elimination of overlapping products and services, centralized functions and regional sales organizations. The combined company could reduce overhead costs in real estate, manufacturing, supply chains, IT and overall G&A expenses, including public company costs. The combined company would target approximately EUR 200 million of reductions in interest expenses to be achieved on a full year basis in 2017. For FY 2014, the combined company would have had net sales of EUR 25.9 billion, a non-IFRS operating profit of EUR 2.3 billion, a reported operating profit of EUR 0.3 billion, R&D investments of approximately EUR 4.7 billion, and a strong balance sheet with combined net cash at December 31, 2014 of EUR 7.4 billion. For comparison in FY 2014, Ericsson had carrier revenues of approximately EUR 25.1 billion, Huawei had EUR 23.5 billion and Cisco had EUR 9.0 billion. In China, Nokia would own Alcatel-Lucent’s 50% plus one share holding in Alcatel-Lucent Shanghai Bell, a company limited by shares supervised by the State-owned Assets Supervision and Administration Commission of China. 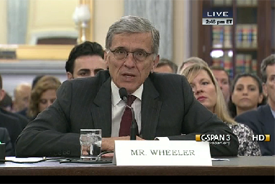 FCC Chairman Tom Wheeler has circulated a draft recommendation to his fellow FCC commissioners recommending that the AT&T/DirecTV transaction be approved with conditions concerning future fiber rollouts by AT&T. Namely, Wheeler would like 12.5 million customer locations to have access to a competitive high-speed fiber connection -- an additional build-out that is about 10 times the size of AT&T’s current fiber-to-the-premise deployment. 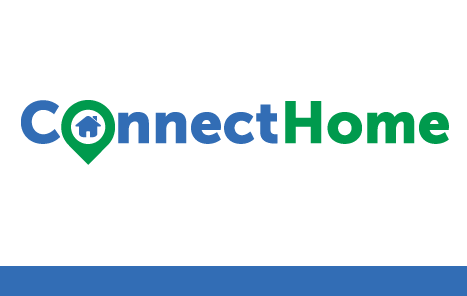 President Obama announced the ConnectHome initiative to provide high-speed broadband to low-income housing communities. The pilot program, which is launching in twenty-seven cities and in one tribal nation, will initially reach over 275,000 low-income households – and nearly 200,000 children. In Seattle, and across its coverage footprint, CenturyLink will make broadband service available to HUD households, via its Internet Basics program, for $9.95 per month for the first year and $14.95 per month for the next four years. In Macon, Meriden, Baton Rouge, and New Orleans, Cox Communications will offer home Internet service for $9.95 per month to eligible K-12 families residing in public housing authorities.As part of its existing ConnectED commitment, Sprint will work with HUD and the ConnectHome program to make its free wireless broadband Internet access service program available to eligible K-12 students living in public housing. This builds upon the free mobile broadband service previously committed to low-income students by AT&T and Verizon, for ConnectED. Best Buy will offer HUD residents in select ConnectHome demonstration project cities, including Choctaw Tribal Nation, the computer training and technical support needed to maximize the academic and economic impact of broadband access. Best Buy will also offer afterschool technical training, for free, to students participating in ConnectHome at Best Buy Teen Centers in Atlanta, Los Angeles, New York City, San Antonio, and Washington, DC. 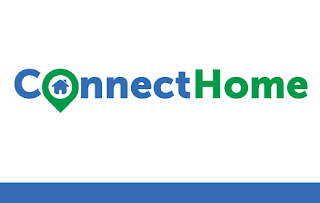 The James M. Cox Foundation, a Cox Communications-affiliated Foundation, will make 1,500 discounted tablets, pre-loaded with educational software, available for $30 to students and their families participating in ConnectHome, in Macon. GitHub will provide $250,000 to support devices and digital literacy training to HUD residents in ConnectHome cities. College Board, in partnership with Khan Academy, will offer students and families in HUD housing in all ConnectHome communities free, online SAT practice resources, and contribute $200,000 over three years to fund digital literacy and personalized college readiness and planning training in Cleveland, Los Angeles, New York, San Antonio, Washington, DC and the Choctaw Nation of Oklahoma. 80/20 Foundation will provide $100,000 to fund digital literacy training in San Antonio.